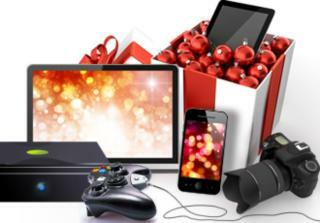 Gadgets and electronics are what everyone wants this holiday season. According to online search trends, consumers are interested in all the latest tech gifts. Smartphones, digital tables, gaming consoles and their respective games are skyrocketing to the top of gift lists everywhere. If you’ve got a tech-lover on your list, find out the most popular gadgets and gizmos for this year’s holiday buying season and start your shopping now! The recent releases of new gaming consoles from Sony® and Microsoft® are two of the hottest items to buy for 2013. Sony® Playstation® 4 currently leads online searches with Microsoft® Xbox One™ following close behind. Competition for these consoles this holiday season is fierce. Retailers, like Walmart®, are expected to be handing out pre-order bands for Black Friday sales. Check local stores to locate any presale offers, especially if the latest consoles are must-haves for your gamers. As for games, interestingly, the Call of Duty Ghost℠ was the only one to make the top ten rankings in overall hot products. Tablets also are proving to be top performers this holiday. Number one is the Apple® iPad® in terms of overall online searches. Its nearest tablet competitors, the Samsung Galaxy® and the Kindle Fire™, are also favorites for this year. When it comes to smartphones, the hot product search lists shows Apple® as a solid contender with the iPhone® 5S, iPhone® 5C and the new iPad Air™. Other rivals for the 2013 holiday season include the HTC One®, Samsung Galaxy® Note 3, Google® Nexus® 5 and the new supersized smartphone Nokia® Lumia® 1520. Believe it or not, a high-tech version of the old-fashioned pedometer is getting high marks for popularity. Fitbit® is the wearable fitness tracker that monitors your steps and links the information directly to your smartphone via Bluetooth®. It also tracks the quality of your sleep and can be set to wake you up in the morning. Its data is wirelessly uploaded to your mobile device or computer to help track your progress. Whichever high-tech items grab your interest, the time to buy is now. These type of coveted gifts quickly clear from online retailers and store shelves, especially during the high-volume, holiday shopping period. Get that present wrapped and delivered to your favorite tech junkie and you’ll receive the best gift of all - thanks!